Shower Smart. The shower is a great place to get some thinking done. Instead of just zoning out while you wash out the suds, set yourself to the task of planning out your novel. Think about the characters as if they were real people — what kinds of things do they do and feel in the morning? Think about your setting or plot points that you haven’t yet decided on. The more time you spend focused on the world of your novel, the more comfortable you’ll be spending the whole month of November there. Trim Your Fingernails. It sounds silly, but it helps. Unless you trained yourself to speed-type with acrylics, fingernails that are too long will likely slow you down. If you’re not a nail-biter, trim your fingernails on Halloween for optimal speed when November 1st rolls around. Practice Word Processing on Your Smartphone. You would never write a novel on your smartphone, right? You say that now, but you might change your mind when you’re hell bent on hammering out 1,667 words per day and stuck on the slow train home, wishing you could figure out how to work on your novel on the fly. Trust me, I’ve been there. Practice Improv. Thinking on your toes is imperative to successfully completing a novel in a month. Remember that a skilled improv actor never drops an idea — he always asks, “Yes, and?” Learn some improv techniques to get your creative juices flowing. It seems simplistic to resort to a list of emotions, but the more feelings you can empathize with, the more easily you can write about them. 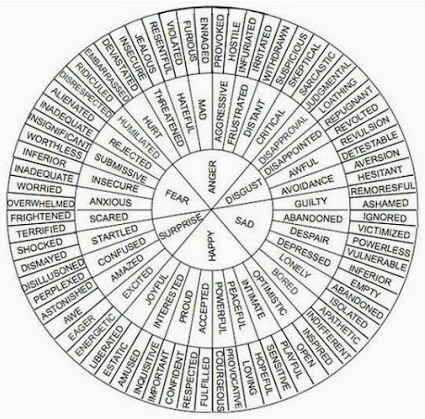 This chart (or anything similar) lists a full range of emotions, which you can use to narrow down a particular feeling. For example, if your character is angry, what kind of angry is it? Insecure and irritated are two entirely different ways to be angry. Thinking about the different ways emotion can manifest will help you to better understand your characters. So, those are my unconventional NaNoWriMo tips — got any for me? Note: I don’t know where the image above came from. If you do, please let me know so I can add image credit. Thanks!